See below a selection of Nemon’s signed hand cast portraits of Sir Winston Churchill. For further information about Nemon’ s working relationship with Churchill, and photographs of his public works, please see our ‘Nemon and Churchill‘ section. 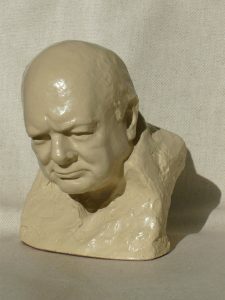 Emerging from a rock-like base designed to evoke the rubble of the Blitz, and Churchill’s ferocity of spirit in adversity, this signed resin bust of Sir Winston is the smallest reproduction currently cast by the Nemon Estate, and was reduced to this size from an original sculpted from life by Oscar Nemon during the 1950’s. Cast and finished by hand in an artisan foundry, each bust is individually patinated with the antique bronze finish used on the Members’ Lobby Churchill in the Houses of Parliament. Standing 9cm high, 6cm wide, and 9cm deep, and weighing 0.3kg, this bust is ideal to be displayed on a desk and carries within its compass the detail and energy of the larger portraits. 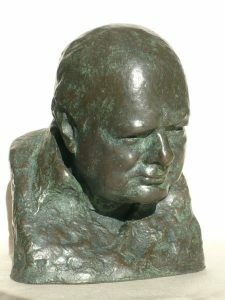 This signed resin bust of Sir Winston Churchill was sculpted from life by Oscar Nemon during the 1950’s and reduced by the sculptor for reproduction. 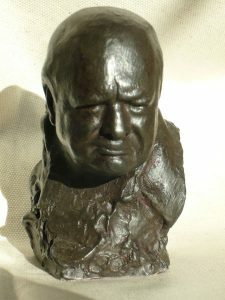 Cast and finished by hand in an artisan foundry, and individually patinated with the antique bronze finish used on the Members’ Lobby Churchill in the Houses of Parliament, this bust weighs 0.9kg and stands 12 cm high, 10 cm wide and 10 cm deep. It is sold with a signed Certificate of Authenticity and brochure showing sketches and photographs of Nemon’s studies of Sir Winston. 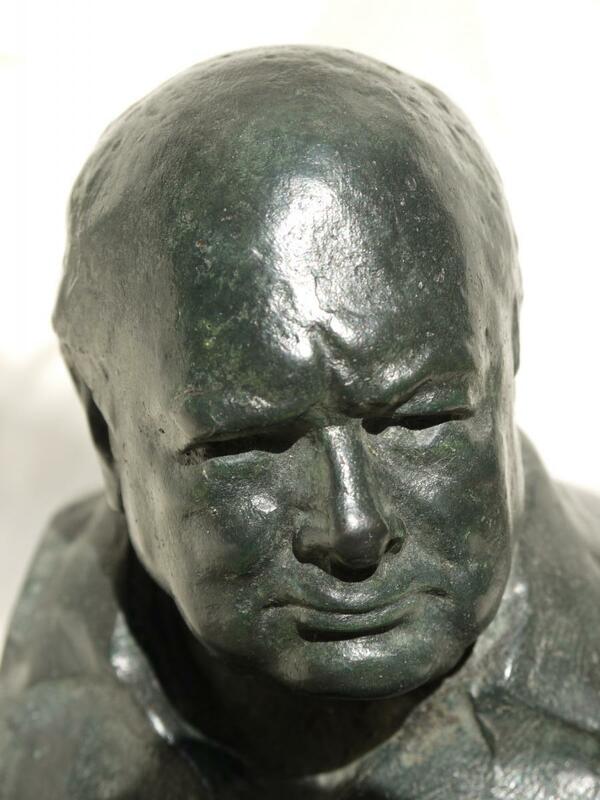 This signed resin bust of Sir Winston Churchill was sculpted from life by Oscar Nemon during the 1950’s and reduced by the sculptor for reproduction. Cast and finished by hand in an artisan foundry, and individually patinated with the distinctive stone finish which Nemon favoured for the busts on display in his studio, which fully reveals all the details of his modelling, this bust weighs 0.9kg and stands 12 cm high, 10 cm wide and 10 cm deep. It is sold with a Signed Certificate of Authenticity and brochure showing sketches and photographs of Nemon’s studies of Sir Winston. 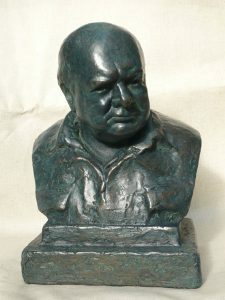 Cast in 85% bronze resin, hand patinated, and finished with a final coat of verdigris to give the characteristic appearance of weathered bronze, this collector’s version of the signed 12cm Nemon bust weighs 1.4 kg and frames Churchill’s head with the collar of his wartime siren suit, commemorating his decisive wartime leadership. This stands 12cm high, 10cm wide and 10cm deep and is sold with a signed Certificate of Authenticity and brochure showing sketches and photographs of Nemon’s studies of Sir Winston. 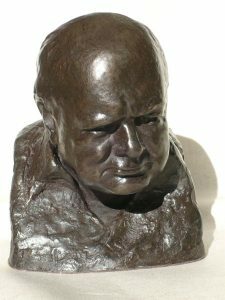 Signed with Nemon’s interlocked ON signature, this powerful bust catches Churchill in a mood which is at once reflective and determined. Cast by hand in 85% bronze resin, and finished with a bronze patina overlaid with traditional verdigris, it weighs 1.4kg, and stands 15cm high, 15cm wide and 12 cm deep. It is sold with a signed Certificate of Authenticity and brochure showing sketches and photographs of Nemon’s studies of Sir Winston. 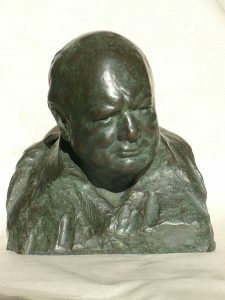 This magnificent signed bronze bust of Sir Winston Churchill in his wartime siren suit was derived from portraits sculpted from life by Oscar Nemon over many sittings at Chartwell and Downing Street during the 1950s and subsequently reduced for reproduction by the sculptor. Hand cast in 85% bronze resin, and individually finished in the characteristic deep patina Nemon created for his public works, this unique work will age and mature like cast bronze. It weighs an impressive 3.8kg and stands 20cm high, 15cm wide and 12cm deep. It is sold with a signed Certificate of Authenticity and brochure showing sketches and photographs of Nemon’s studies of Sir Winston. Exclusively available from the Nemon Estate in a Limited Edition of 500, the Westerham Churchill was issued in 2015 to commemorate the half century of Winston Churchill’s death. 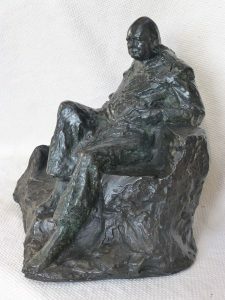 Based on a signed maquette for the full-size statue which was retained in Oscar Nemon’s Studio, this powerful and meditative sculpture shows Churchill poised in contemplation. Hand cast in 85% bronze resin, and finished with a patina which matches the Westerham original, the maquette weighs 9.2kg, and stands 25 cm high, 22 cm deep and 26 cm wide. It is sold with a signed Certificate recording the edition number, and a brochure showing sketches and photographs of Nemon’s studies of Sir Winston. Cast in 100% bronze by Pangolin Editions, using the traditional lost wax method, the Blenheim Churchill commemorates Sir Winston’s Oxfordshire birthplace and is issued in a Limited Edition of 75. 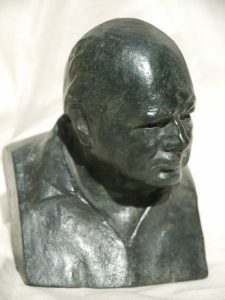 A maquette for the resonant statue unveiled in the gardens at Blenheim in 2015, this heirloom bronze expresses Churchill’s vision and determination, and reflects the close understanding between him and the sculptor Oscar Nemon. Each bronze is engraved with the edition number alongside Nemon’s signature, and weighs 1.8kg. The bust measures 15 cm high, by 10 cm wide by 12 cm deep and is supplied in a rigid presentation box with a signed Certificate confirming the edition number and brochure showing sketches and photographs of Nemon’s studies of Sir Winston. 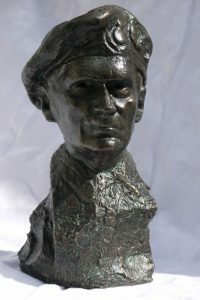 The bust of Monty sold by the Nemon Estate shows him in the distinctive badged beret which became his trademark, having been originally given to him by a soldier when inspecting a tank on the front line in North Africa. Archive material including drawings and photographs relating to the creation of this bust is on display in the Imperial War Museum in London. Sculpted from life by Oscar Nemon in the 1950s, and reduced by him for reproduction, the portrait is signed on the back with his linked ON signature. Cast by hand in 85% bronze resin, it is individually finished with a verdigris wax patina to age like bronze. It stands 20cm high, 15cm wide, and 12 cm deep, and weighs 2kg. It is sold with two photographs of Nemon sculpting Monty in his garden, and historical information detailing the process.